The following statement has been issued regarding the incident at Iroquois' facility in Waddington, NY. Our well-trained field technicians were performing a maintenance activity at our valve facility located off of RT37 in Waddington when a fire broke out. They notified our Gas Control Center, who in turn notified Waddington Emergency Responders. Waddington Fire and Rescue arrived at the scene quickly and as a precautionary measure, they evacuated those within ¼ mile and closed RT 37 to traffic. The appropriate valves were closed, the fire extinguished and the site was made safe. The road was reopened at approximately 5:30PM and those evacuated returned to their homes. The safety of our employees and the public are our top priority and we extend our sincere appreciation to all the emergency responders for their assistance and cooperation with this incident. One employee sustained minor injuries and was later transported to the hospital where he was treated and released. The incident has been reported to the appropriate regulatory authorities. Any equipment necessary for the safe operation of the facility that could have been impacted by this incident has been tested and made safe. There was no impact to our customers and gas continues to flow on the line. Please respond to my questions. > I just tried to call your office line, left you a VM. > Tried you cell and no answer. > I am an independent pipeline safety investigator based on Binghamton NY. I have been reporting on pipeline safety issues since 2012 as a pubic interest researcher and Independent Media journalist. I have filed technical comments on several pipeline dockets, as well as a recent PHMSA rulemaking. > I am seeking some basic information about the event which happened yesterday, Friday 9/22/2017, near Rt 37, near Waddington, St. Lawrence County. > For your information, I am CCing Mr. Byron Coy, who is Eastern Region Director for the Pipeline and Hazardous Materials Safety Administration (PHMSA). > Since this was not reported by any news outlet I can find, and there is no information on your website, I want to make sure there is a public record of this event. I called the operations line, and the person who answered referred me to you. > Was there scheduled work on that valve station at the time of the event? What exactly was the nature of the work? > Was there a fire or a release of gas? What volume of gas was released? > Was there property damage? Describe. > What was the actual impact radius? > Were there any injuries? What were the nature of the injuries and the condition of the patient(s)? Name(s) may be redacted. > What was the cause? > Is the problem resolved? > Is the pipeline now or at any time shut-in? Between what hours? > Were your customers impacted? > Was PHMSA and/or NTSB notified? > Was the National Response Center notified? At what time? > What is the Incident Number? > What is the name of your area manager and the site manager? > What direction was the pipeline flowing at the time of the incident? > What is the location of the nearest upstream compressor station? > Are you presently flowing gas north into Canada? > What is the status of the SoNo project? 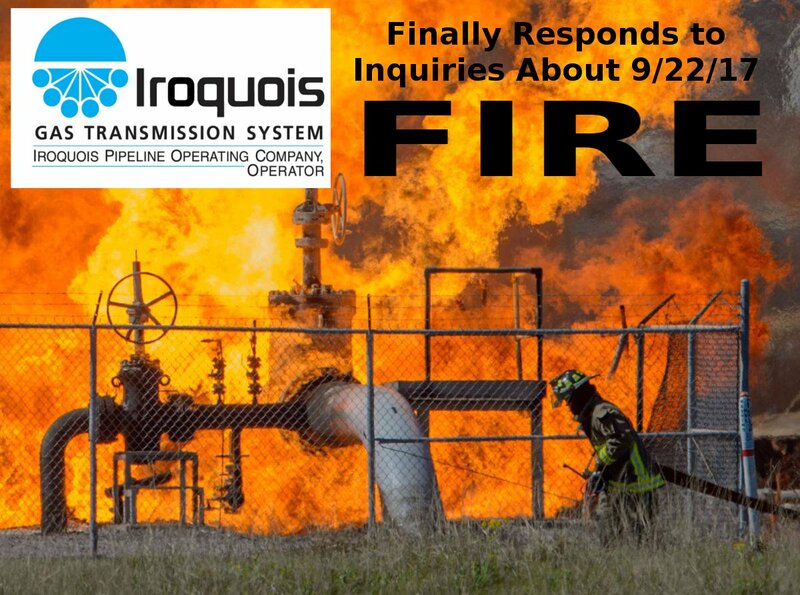 > Does Iroquois Transmission have any active new projects before FERC? What are the docket numbers? > Why is Iroquois Transmission clearing trees in the Town of Newton Stone Bridge Preserve? Are you planning on building facilities there?